Join the National Agri-Marketing Association for the 8th annual NAMA Boot Camp, August 16-18, 2011 in Kansas City. The tour is an on-farm experience where attendees will tour as well as learn about different operations. The tour includes a trip to Kurzweils Meat a family-owned and operated, full circle operation. They raise their own grain, feeding raised grain to their hogs, and then using some raised hogs at the meat market. The tour will also visit the Harrisonville, MO, Retail/Wholesale location of Crop Production Services which is one of the largest National Agriculture Wholesale and Retailers in North America. A “farm kid” from a farrow-to-finish swine operation and a former quality assurance chemist, Becky Johnson provides a unique combination of technical, practical and firsthand knowledge about the food and agricultural industry. Becky combines her production ag roots and food industry experience with an understanding of consumer concerns to help clients communicate messages that resonate with their target audiences. Learn how to communicate effectively with producers. The producer panel has become a Boot Camp favorite and attendees won’t want to miss the valuable insights from producers. The panel will be moderated by Tom Hudson, Successful Farming and Agriculture Online. Three producers will be joining the moderator to share their insights. Spend a year in the life of a specialty producer. This session will explore the challenges and business decisions that a specialty producer faces in a year. Rick Russell is a fifth generation family farmer/rancher in Stafford and Pratt Counties in south central Kansas. He raises corn, soybeans, wheat, rye, and has a background cattle operation during the winter months on 2500 acres. A crop consulting service, along with GPS mapping and guidance, is part of the farm management. Companies are increasingly using the power of social media to connect with current members and to build membership and brands. Others hold back, concerned about the difficulty in controlling messages and potential damage to their brand. In this discussion, Randa will outline the myths, trends, strategic paradigms and possible problem scenarios that can happen online so you can simplify your approach. Creating Effective Advertising in Agricultural Print Media will offer you an opportunity to learn what types of creative approaches in print advertising work best. You’ll learn time-tested rules to the road and see actual examples of print ads that have been measured by Readex in various agricultural publications. The session will conclude with a short, interactive experience where you guess which ad scored best! Step into a producer’s boots without having to head to the farm. From risk management to calving, this session will cover the events a producer endures throughout the year. Jimmie Long currently serves as the President of the Missouri Cattlemen’s Association. Jimmie presently runs Jimmie Long Livestock, which is his own order buying firm and his customers allow him to buy stocker cattle, feeder cattle and breeding stock for their ranches, backgrounders and feedlots. He is also a Field Representative for Kingsville Livestock Market. Join Bill Shelton, of Left Field Creative, as he shares a highly successful approach to creating a comprehensive brand identity, position, and personality for your product or brand. This step-by-step process will give you the tools to start re-branding and re-positioning the moment the session ends. Two sets of producers will share their experiences regarding employment on the “family farm” as well as challenges and rewards they face as farmers. They will discuss how they help fellow generations learn from past experiences as well as current technologies and ideas to make their operations functional and profitable. Ken & Brad McCauley comprise a father-son farming duo from White Cloud, Kan. They each have their own farms: Ken owns K&M Farms, Inc., while Brad is the owner and operator of McCauley Inc. Together, their operations total 4,600 acres. They raise both corn and soybeans, which are grown mostly for seed. Working the land is in the McCauleys’ blood: Ken started farming 160 acres while in high school and began farming full-time nearly 40 years ago; Brad followed suit in 1994, beginning his farming career while still in high school. Kathy Chinn is a 4th generation farmer and Chris, her daughter-in-law, represents the 5th generation in the Chinn Family. Chinn Hog Farm is a 1,500 sow, farrow-to-finish hog farm in northeast Missouri. Kathy manages the daily operations in the sow barns and Chris oversees the financial records of the farm and the family-owned feed mill. Kathy is married to Gary and together they have two sons, Kevin and Kyle, and four grandchildren. Chris is married to Kathy’s oldest son, Kevin, and they have two children, Rachelle and Conner. Listen as professionals in the industry discuss the best way to manage your career. This interactive session will feature client, agency and media professionals that have significant experience and expertise. Come armed with questions! The Center for Food Integrity is dedicated to building consumer trust and confidence — bringing together stakeholders at every level of the food chain to reach consumers in meaningful ways with a unified voice and address the issues most critical to consumers. You won’t want to miss the 2011 NAMA Boot Camp! To register now, visit http://www.nama.org/ConferenceRegistration/Default.aspx?confid=35. For more information on the NAMA Boot Camp and hotel reservation information, visit http://www.nama.org/programs/index.html. It is with a heavy heart that we announce the passing of long time NAMA member and friend, Denny Eilers, Iowa Photo Farm, Inc.
A Cornbelt NAMA member since 1990, Denny has been the photographer for many NAMA Agri-Marketing Conferences and will be greatly missed. 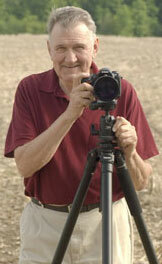 The Iowa Photo Farm was operated by Denny and Gwen Eilers. Denny served as chief photographer and Gwen was the business and production manager. They were located on a working farm in scenic northeast Iowa, raising corn, soybeans and a variety of locally grown vegetable crops. Denny died Sunday, June 26, 2011, at Central Community Hospital, Elkader. Visitation hours are this Thursday, June 29, from 4:00 – 8:00 p.m. Services will be at 10:00 a.m. Friday, July 1, at St. Patrick Catholic Church, Monona, IA. Friends may call one hour before service at the church on Friday. Private burial will be in Mount Olivet Cemetery, Guttenberg, IA. If you would like to share your thoughts and memories, Leonard Funeral Home will deliver your message to the family. Click here to deliver your message/memories. Registration is now open for the 2011 Trends In Agriculture, November 8-9 in Kansas City. The theme for this year’s Trends In Agriculture is Progress Through Productivity. A growing wave of food insecurity threatens more than 1 billion people around the world, and the number of malnourished could grow staggeringly as the population reaches 9 billion by mid-century. Solutions exist today to help meet food needs, but consumers don’t want technology used in food production. Right? Jeff Simmons will explore this modern myth that consumers don’t want modern, efficient technology used in food production. To better understand consumer opinions, Elanco commissioned a research review of 27 studies accounting for more than 97,000 consumers in 26 countries to further analyze this trend. The results may surprise you. It’s time to call a truce to the debate on the role of technology in sustainable food production and assure the 3 Basic Rights its use can afford. Learn more about consumer perceptions of technology and the role technology and choice play in feeding a growing population. Join the dialogue today at www.plentytothinkabout.org. To register for the 2011 Trends In Agriculture, visit http://www.nama.org/ConferenceRegistration/Default.aspx?confid=36. Sponsorships are now available for Trends In Agriculture. If you are interested in sponsoring a session, please contact Jenny Pickett at jennyp@nama.org or call 913-491-6500. The deadline for submitting nominations for the Professional Development Awards of Excellence is September 1, 2011. These awards will be presented at the 2011 Trends In Agriculture meeting, November 8-9, at the Hyatt Regency Crown Center in Kansas City. To download the nomination form in an Adobe .PDF format, visit http://www.nama.org/awards/2011PDAapp.pdf. The Dairy Farmers of America has Lunch and Learn programs for their summer interns, who come from a variety of schools with varying majors. 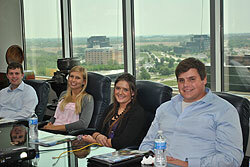 During the June 8 Lunch and Learn, the interns were introduced to NAMA. Kristen Marshall, AgCall U.S.A., Inc., Vice Chair of NAMA’s Careers Committee and Chair of the Marketing Competition and Debbie Brummel, NAMA, gave them an overview. This included some of NAMA’s history, its mission, and an overview of both professional NAMA and also the student NAMA Careers Program. MoKan NAMA members gathered at the Golden Ox Restaurant on May 13 to learn about the Center for Food Integrity (CFI) from Cliff Becker, CMA Consulting. The CFI, a non-profit organization, works to equip people in today’s food system with the skills and messages they need to effectively communicate with consumers. The CFI has learned that before a message can be heard, there must first be trust by the public. They’ve also learned that showing competence is not as advantageous as preparing messages that show shared values. They have several programs in place, including their Annual Consumer Trust Research, a Best Food Facts website, and an Annual Food System Summit. Their goal is to facilitate a more informed public conversation on food system issues. NAMA Boot Camp Sessions Announced! Register today for the 8th annual NAMA Boot Camp, August 16-18, 2011 in Kansas City. Sign up for this program today to learn more about the agri-marketing industry. This year the Boot Camp will take it to a new level expanding on marketing and agriculture basics. There will be plenty of opportunities for networking during the reception on Tuesday, in addition to during the Opening General Session. Network during lunch on Wednesday and during the reception at the Boulevard Brewery or at the Dine Around that evening! 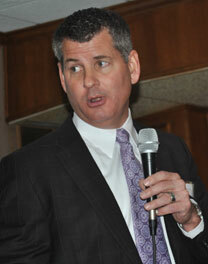 For more information on Boot Camp speakers and sessions, visit http://www.nama.org/programs/index.html. Join Bill Shelton, of Left Field Creative, as he shares a highly successful approach to creating a comprehensive brand identity, position, and personality for your product or brand on Thursday, June 9, at 1:00 pm central time. Program planning is underway for the 2011 NAMA Boot Camp! The 2011 NAMA Boot Camp will take place August 16-18 at the Hyatt Regency Crown Center in Kansas City. 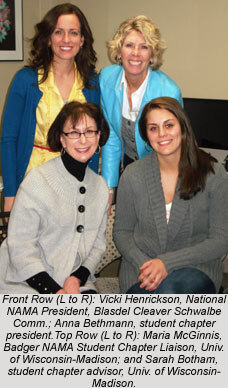 Vicki Henrickson, National NAMA President, attended the chapter meeting of the University of Wisconsin – Madison’s Student NAMA chapter on Wednesday, March 23, 2011.